What do Geum Jan Di, Jun Ji Hun of Sassy Girl fame, and other female Korean actresses have in common? The answer? They all have beautifully radiant skin and they all follow a tedious 5-step skin care regimen. Yes 5 steps, not the 3 step rule which most of us are familiar with. Five steps may seem like a difficult commitment to make given our busy schedules. However, once you break these steps down, you’ll realize that it doesn’t take up that much more time. After all, what’s another minute added to your daily skincare routine if it would mean having perfectly flawless skin? So, let’s get down to business. What exactly are the five steps? and oily skin) and a second time in the evening before retiring, to remove all traces of make- up and dirt. Cleansing oil also works great at removing build-up. 2. Massage and Mask - Massage has been around since the third century b.c. and was widely used to treat medical problems. Today, researchers and scientists have discovered that regular facial massage works wonders in slowing down the skin aging process. Visit: http://www.answers.com/topic/facial-massage for tips on how to give yourself a facial massage. For women with oily skin problems, skip the massage as this can trigger your oil glands to produce an excess amount of sebum. Instead, apply a facial mask 1-2 times weekly. 3. Tone - Applying toner is essential in removing dead and dull skin cells found at the surface of our skin. With regular use, you’ll find that your skin will be glowing in no time! 4. Serum/Essence - There are many different types of serums available which cater to your specific skin problems (i.e. anti-aging, acne prevention, skin brightening). Unlike regular facial moisturizers, serums are made up of smaller molecules which have the ability to penetrate deeper layers of your skin and give it all the extra nutrients it needs. 5. Moisturize - Use a moisturizer with spf to protect your skin from the sun’s harsh rays and a night cream to replenish lipids. 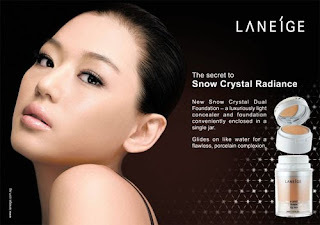 Try Laneige, recently available in the Philippines. Their products work well and are very affordable. My sister-in-law swears by them and she's quite difficult to please when it comes to skincare.